Our research team is comprised of scientists from the UK, Spain, and the United States. Short biographies for each member can be found below, along with links to their main research pages. 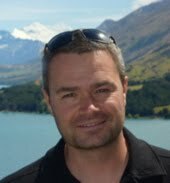 Dr. Joseph Wheaton (Utah State University, USA): Joe completed his MS at the University of California at Davis, and his PhD at Southampton University before returning to the United States, where he is currently an Assistant Professor in the Watershed Sciences Department at Utah State University. 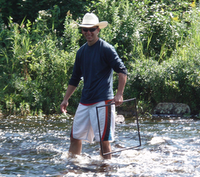 With an expertise in landscape surveying and hydraulic modeling, his current research interests span a diversity of topics, including developing improved morphodynamic models for gravel-bed rivers, using beaver as a management tool in degraded streams, and developing simple, 'cheap and cheerful' methods for stream restoration. Dr. James Brasington (Queen Mary University of London, UK): James completed his PhD at the University of Cambridge, and currently is Professor of Physical Geography at Queen Mary University of London in the UK. James is a river basin scientist who works on two synergistic themes: (a) monitoring fluvial morphodynamics and sediment transport, particularly in braided rivers; and (b) developing numerical methods for simulating hydrological and geomorphological dynamics across a range of time and space scales. Geographically his research spans a diverse range of environments from the hot and dry (Iraq, Spain) to the warm and wet (Nepal) and the cool and humid (Scotland and New Zealand). He also enjoys playing with sand and water in the laboratory which he passes off as physical modelling. Alan Kasprak (Utah State University, USA): Alan holds an MS from Dartmouth College, and is currently a doctoral student at Utah State University within the EcoGeomorphology and Topographic Analysis Laboratory. His research focuses on disentangling the background geomorphic dynamics of streams from the influence exerted by water and sediment fluctuations arising from anthropogenic impacts on watersheds. He is also interested in the role of eco-geomorphic feedbacks in shaping streams. His past work has focused on the dynamics of large wood delivery to streams, and the sourcing and export of fine sediment resulting from timber harvest in forested watersheds. He is currently developing morphodynamic models to predict evolution of braided channels, using the River Feshie as a primary dataset for model validation. Dr. Damia Vericat (Forest Sciences Centre of Catalonia, Spain): Damia completed his undergraduate and doctoral degrees at the University of Lleida in Spain, and has held postdoctoral positions at the Forestry Centre of Catalonia (his current institution) and Aberystwyth University. Damia's research interests include topics related to sediment transport and sediment/water dynamics in regulated channels, ultimately considering their impacts on ecologic communities in streams. Dr. Mark Smith (University of Leeds, UK): Mark completed his undergraduate and PhD work at Durham University (UK), and is currently Lecturer in Physical Geography at the University of Leeds (UK). His interests lie in hydrology, hydraulics, and process geomorphology, and his current research is focused on a diversity of topics, including development of through-water terrestrial laser scanning, improving hillslope hydrological models, and understanding the hydrological drivers of malaria transmission in Africa. Dr. Julian Leyland (Southampton University, UK): James completed his undergraduate and PhD work at the University of Southampton, and was an RCUK academic fellow prior to his appointment as Lecturer in Physical Geography at Southampton. His research interests span a wide range of areas, from numerical modeling of stream channel incision to evaluating the reliability of landscape evolution models. His is actively involved in research on the Mekong River Delta examining the forcings behind bank erosion and sediment input to channels. Dr. David Sear (Southampton University, UK): David completed his PhD at the University of Newcastle-upon-Tyne, and is currently Professor of Physical Geography at the University of Southampton. David's research interests span from understanding channel morphodynamics via high-resolution topographic surveying (and extending those findings to the evaluation of salmonid habitat), to the mapping of medieval towns which provides insights into the effects of sea level change and coastal erosion on populations. He has helped to develop the fluvial audit method, a means of rapidly characterizing the sediment dynamics of a stream system via field-based surveys. Dr. Stephen Darby (Southampton University, UK): Steve completed his PhD at the University of Nottingham, and currently is Professor of Physical Geography at Southampton University, where he serves as the Vice Chair of the British Society for Geomorphology. His research interests include investigating the morphodynamics of large, monsoonal rivers, understanding the morphodynamics of submarine channels, landscape evolution modeling, the the eco-geomorphic effects of vegetation on channel form. Niall Lehane (Queen Mary University of London, UK): Niall completed his undergraduate work at the University College of Cork (Ireland), and currently serves as Field Technical Officer at Queen Mary University of London. He has expertise in terrestrial laser scanning and topographic surveying, and assists the River Feshie project in terms of spatial analysis and postprocessing of survey data.